With the engine work on the Fiesta now completed, bar the correct carburettor and a trip to the rolling road, we decided to turn our attentions to the car's bodywork and interior. Probably the best way to improve the appearance of any car is to change the wheels and tyres. 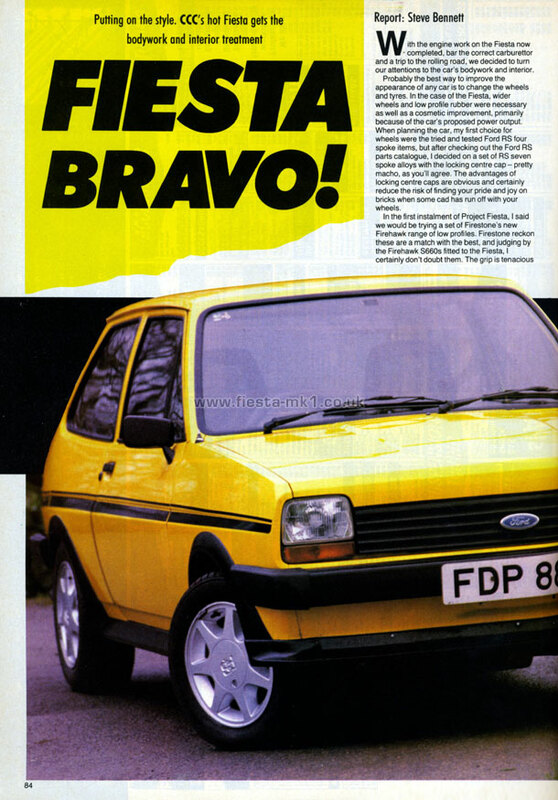 In the case of the Fiesta, wider wheels and low profile rubber were necessary as well as a cosmetic improvement, primarily because of the car's proposed power output. When planning the car, my first choice for wheels were the tried and tested Ford RS four spoke items, but after checking out the Ford RS parts catalogue, I decided on a set of RS seven spoke alloys with the locking centre cap- pretty macho, as you'll agree. The advantages of locking centre caps are obvious and certainly reduce the risk of finding your pride and joy on bricks when some cad has run off with your wheels.